September is the start of an exciting season for South Africans. With the anticipation of spring and Heritage Day celebrations, we certainly cannot go through the month without a lekker braai in true South African style. At MiWay, we’re not just about car insurance – we enable our clients to live their way. On your marks. There’s more to hosting a braai than just having people over and the smell of meat on the braai! If you’re planning your get together on a popular date (like 24 September), you need to invite your guests well ahead of time. The last thing you want on braai day is to have nobody show up! Get the necessary permissions and inform your neighbours, send out your invites and get set to have fun! Get set. Now that you’ve got your dates, times and guest list sorted, you’re half way there. Get your braai menu ready by checking on guest’s dietary requirements and stocking up on your ingredients. When choosing your meat, get cuts or pieces that will be easy to prepare and allow you to enjoy the time with your guests. For ultimate flavour infusion, marinate your meat overnight. Whether you’re supplying the salads or doing a bring-and-share, spice things up by being adding creativity and aim to wow the other guests. Ready? Hosting doesn’t begin when the first guest arrives; it gets going long before that. Get your entertainment area ready and set up for the fun times ahead by making sure your braai stand is clean and ready for the fire – don’t forget that the braai master needs to be part of the fun! Giving yourself enough time to get the area ready will keep you feeling calm when your guests start arriving. Make sure you have the right tools on hand for the braai – braai tongs, cutlery and crockery, ice, tables and chairs (unless you’ve asked your guests to bring their own) etc. Don’t forget your playlist! Braai… Time to get the meat sizzling, get the braai master kitted up and in position – this is the key guy for the day. Whether you’re the braai master yourself or delegating the braaing to someone else in the group, remember that the person holding the tongs is responsible for the braai – and all the tasting that comes with it. Do not interfere, unless you’re assisting as per request. As your guests arrive and the conversations start flowing, bring out the snacks to get your hungry guests ready for what’s to come. Well done! 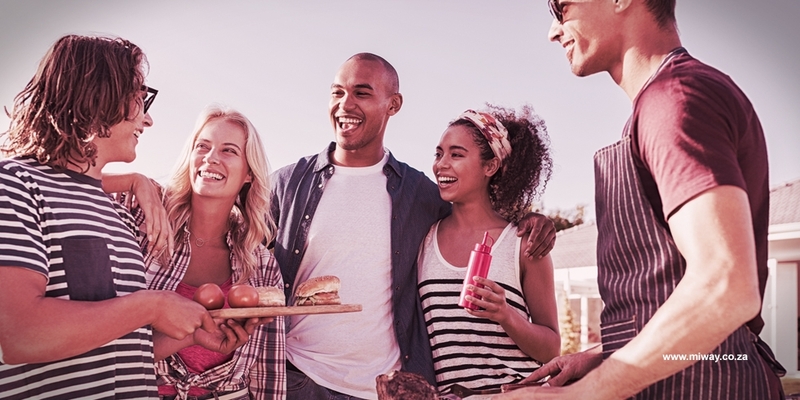 Now that you’re well on your way to hosting the ultimate braai this season, remember that it’s all about the meat and good vibes. Added tip – if you clean up as you go you will have less to worry about the next morning. Now, we do understand that mistakes happen… let us worry about your home and its contents so that you can go on and live your way this braai season.